In an effort to help police more efficiently monitor transactions at cash-for-gold and secondhand goods stores in Cherry Hill, Township Council is considering instituting new licensing and reporting requirements for all merchants who deal mainly in the sale of secondhand goods. The new regulations will free up police time and resources, and more importantly, will make it easier to identify when stolen items are pawned or sold. This is an important change in light of recent growth in the cash-for-gold sector here in the Township. Read more about it by clicking here. On Friday morning, members of my senior staff and I, as well as Council President David Fleisher, Councilman John Amato, and Councilwoman Melinda Kane, sat down for breakfast with Congressman Rob Andrews, to talk about the state of Cherry Hill. We had a very positive and informative discussion with the Congressman about various initiatives we are undertaking here in Cherry Hill, as well as issues facing the town. Cherry Hill is a new addition to the Congressman’s district for 2013, and Council and I look forward to working with him in the future. The AARP and Cherry Hill Township have once again partnered to offer free tax preparation assistance to residents ages 55 and older. Sessions will be held from 10 a.m. to 2 p.m. every Tuesday and Friday from Feb. 1 through April 12 in the N. John Amato Council Chambers (Room 208) at Town Hall. No appointment is necessary. Preparing your tax return can be a daunting task; please take advantage of this valuable service! For more information, click here. The Township’s first-ever Bingo event drew about two dozen residents to Croft Farm on Friday morning. Participants, joined by Councilwoman Melinda Kane and staff from the Recreation Department, enjoyed refreshments and a good time with friends – and in the process, took home a number of great prizes, including a free trial membership to the Cherry Hill Health & Racquet Club, and gift certificates for ShopRite, Ponzio’s, Short Hills Deli, and Caffe Aldo Lamberti. By all accounts, it was a great morning! For additional fun, free events around town, visit the Recreation Department online at www.CherryHill-NJ.com, or check out the latest edition of the Community Magazine by clicking here. Cherry Hill has been awarded a $20,000 state grant to support a number of programs for individuals with disabilities, including the Teen Social Scene program and New Horizons, which provides accommodations for disabled children in the Township’s Morning Fun summer camp program. It will also help fund staff training, and Connections, a program that provides support for disabled individuals who want to participate in any existing Township recreational activity. For more information, click here. The Cherry Hill African-American Civic Association, the Black Broadway Theater Group and the African-American Culture Clubs of Cherry Hill High Schools East and West will present “Uptown,” as part of their annual Black History Month program, at 7 p.m. Saturday, Feb. 2 in the Cherry Hill East auditorium. This year’s show is written, directed and produced by Keisha Blount, a 2005 graduate of Cherry Hill East. It promises to be both entertaining and educational. The event is open to the public, and admission is free. Read all about this year’s show in the Philadelphia Inquirer and Cherry Hill Sun. For more information, click here. Girls in 4th through 12th grades and their parents are invited to attend the next installment of “Girls Night Out,” from 7 to 8:30 p.m. Thursday, Feb. 7 at Rosa International Middle School. Dr. Charlotte Markey, associate professor of psychology at Rutgers University, will lead the discussion about nutrition and how eating habits affect our everyday lives. Attendance is free, but registration is preferred. For more information, click here. In an effort to help police more efficiently monitor transactions at cash-for-gold and secondhand goods stores in Cherry Hill, Township Council is considering instituting new licensing and reporting requirements for all merchants who deal mainly in the sale of secondhand goods. The new regulations will free up police time and resources, and more importantly, will make it easier to identify when stolen items are pawned or sold. This is an important change in light of recent growth in the cash-for-gold sector here in the Township. Read more about it by clicking here [http://www.cherryhill-nj.com/CivicAlerts.aspx?AID=217] . 2013, and Council and I look forward to working with him in the future. The AARP and Cherry Hill Township have once again partnered to offer free tax preparation assistance to residents ages 55 and older. Sessions will be held from 10 a.m. to 2 p.m. every Tuesday and Friday from Feb. 1 through April 12 in the N. John Amato Council Chambers (Room 208) at Town Hall. No appointment is necessary. Preparing your tax return can be a daunting task; please take advantage of this valuable service! For more information, click here [http://www.cherryhill-nj.com/CivicAlerts.aspx?AID=218] . Cherry Hill has been awarded a $20,000 state grant to support a number of programs for individuals with disabilities, including the Teen Social Scene program and New Horizons, which provides accommodations for disabled children in the Township’s Morning Fun summer camp program. It will also help fund staff training, and Connections, a program that provides support for disabled individuals who want to participate in any existing Township recreational activity. For more information, click here [http://www.cherryhill-nj.com/CivicAlerts.aspx?AID=219] . 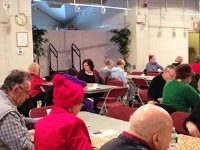 The Township’s first-ever Bingo event drew about two dozen residents to Croft Farm on Friday morning. Participants, joined by Councilwoman Melinda Kane and staff from the Recreation Department, enjoyed refreshments and a good time with friends – and in the process, took home a number of great prizes, including a free trial membership to the Cherry Hill Health & Racquet Club, and gift certificates for ShopRite, Ponzio’s, Short Hills Deli, and Caffe Aldo Lamberti. By all accounts, it was a great morning! For additional fun, free events around town, visit the Recreation Department online at www.CherryHill-NJ.com [http://www.CherryHill-NJ.com] , or check out the latest edition of the Community Magazine by clicking here [http://www.cherryhill-nj.com/index.aspx?nid=127] . Girls in 4th through 12th grades and their parents are invited to attend the next installment of “Girls Night Out,” from 7 to 8:30 p.m. Thursday, Feb. 7 at Rosa International Middle School. Dr. Charlotte Markey, associate professor of psychology at Rutgers University, will lead the discussion about nutrition and how eating habits affect our everyday lives. Attendance is free, but registration is preferred. For more information, click here [http://www.cherryhill-nj.com/DocumentView.aspx?DID=913] .